Champions Online offers action-packed combat exhaustive character creation tools and brilliant visuals in a polished, humour-laden package. Without exception, anyone who’s ever been bitten by the comic book bug will have at some time imagined what it would be like to possess super powers. We’ve all fantasised about gripping the teacher or boss in a telekinetic chokehold, turning invisible and slapping a thug twice our size upside the head, or mocking everyone else’s physical shortcomings with our newfound X-ray vision. Or maybe it is just me, and my inability to transcend the restraint of daydreaming as most people can the moment they hit adulthood. Either way, if you’ve survived thus far into this review for Champions Online, then chances are you’ve at one time or another mused about being something beyond “normal”. 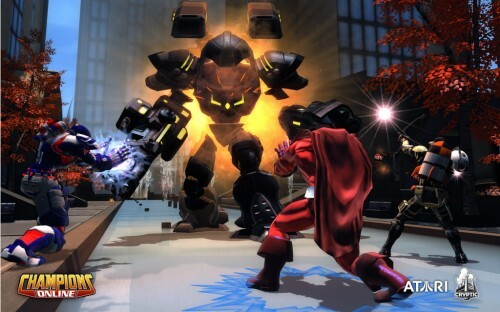 Champions Online, the spiritual sequel to Cryptic’s City of Heroes, is at its heart a superhero simulator, one which features character creation tools so robust that players can design almost anything their imagination is capable of. 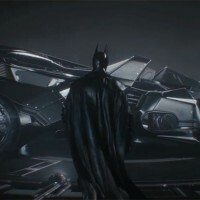 Fortunately, the game surrounding this vigilante designer itself isn’t too shabby either. 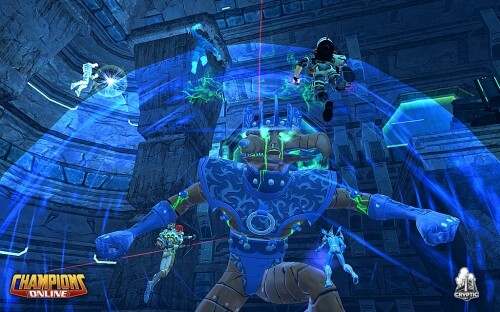 While it doesn’t break drastically from the unapologetically static grinds of its contemporaries, as far as multiplayer online role-playing goes Champions succeeds on most levels, offering a colourful and diverse virtual world, amusing characters and production values that put most other online realms to shame. More importantly it’s fun with a gamma-radiated “F”, containing arcade-style gameplay and superbly written objectives that are entertaining enough to just about hide the fact that you are still forever grinding up, delivering Secret Serum C from one generic NPC to the next. 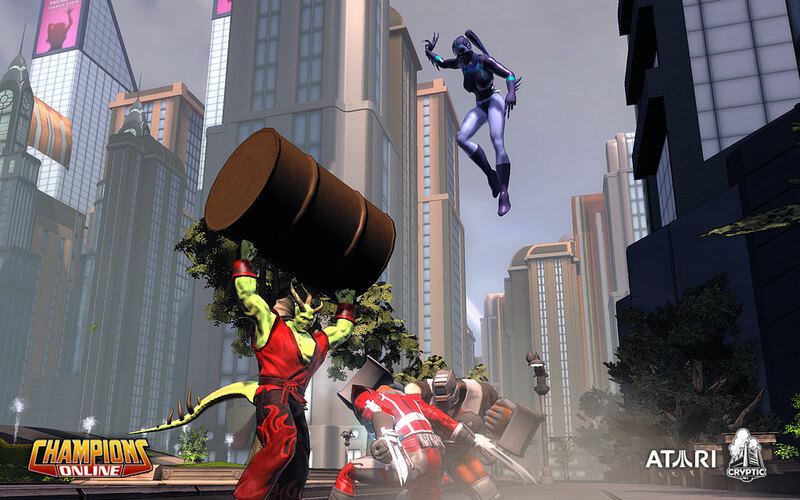 Champions Online is based on the Champions HERO system role-playing game, which was first published in 1981 and has survived five editions, but has always enjoyed a niche following. 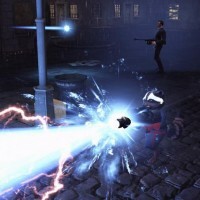 Cryptic grabbed the licence after their planned Marvel Universe Online project was scrapped, and while the Champions Universe may lack recognisable characters, it is an interesting world nevertheless, unabashedly cribbing from every popular franchise imaginable and littered with pop culture references throughout. Cryptic’s humour consistently carries this amalgamation of Golden, Silver and Modern Age eras, with self-depreciatingly brilliant analogues of the Justice League, Hulk and many, many more. 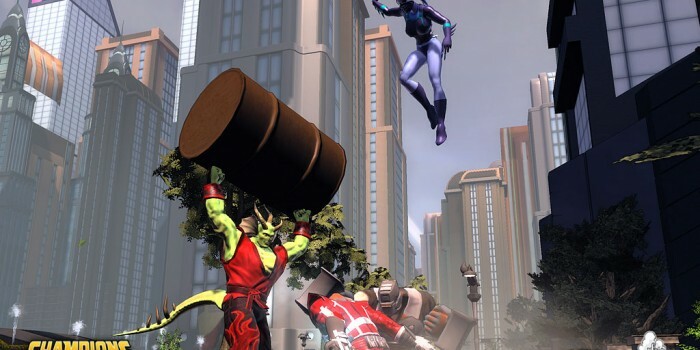 While the Champions Universe lacks the established titans that Sony’s upcoming DC Universe Online will soon parade, it won’t take long before you’ve warmed to such characters as the stoic Defender or conceited Foxbat. And any game which wryly “cameos” Strange Brew’s Bob and Doug McKenzie and Hurley from TV’s Lost is simply begging to be explored. Your avatar via which you’ll traverse this world is comprised from a near endless selection of components, archetypes and powers. Crafting your crime fighter is almost a game in itself, and the chance to showcase your creations on the Champion website, complete with profile and background bio, as well as vote on others, ensures that designing a hero is a highly personal element; and a far cry from the barely distinguishable avatars seen in many other MMOs. With the plethora of tools and outfits allowing everything from muscular spandex Supermen to anime-inspired martial artists, hulking mechs and winged warriors, admiring other player’s vigilantes is just as entertaining as modifying your own. Currently, vanity items such as action figures (super-deformed versions of prominent heroes and villains that follow you about) are available via the micro-transaction system, with costume parts and pets imminent. Though the game currently features only five instances, from the radioactive mutant-infested desert of Project Greenskin to the frozen Canadadian tundra they are absolutely huge, and essentially contain a dozen environments each. The instances also change when certain conditions have been met – for example, after thwarting the insectoid Qular invasion on Millennium City in the Open Mission ‘Battle of the Ironclad’, your hero later returns to the futuristic metropolis to find it in a state of restoration. To traverse these landscapes, you’ll soon be required to select a travel ability (with a second available at a later level) which include the classic flight, jet boots, super-speed and even the facility to web-swing or ride on chunks of rock/ice. There is no real penalty for dying, and with respawn spots dotted liberally about each instance you’re never more than thirty seconds away from the action. Perhaps the most innovative element of Champions Online is the Powerhouse. Accessed through teleportation portals, this safe haven allows you to not only spend your talent and skill points, but “retcon” existing abilities. Retconning allows you to return to a past point in your character’s development, or even start from scratch; though while your most recent decisions can be reversed for free, the older abilities require serious money to overturn. The Powerhouse also features a series of training rooms, not totally dissimilar to the X-men’s Danger Room, and while frequently retreating here with every level progression can be irritating early into the game, it’s a nifty and well-implemented system that encourages you to experiment with your hero and systematically fine-tune their powers and strategies. To complement the action-orientated gameplay, Champions Online provides surprisingly effective gamepad support for an MMO; though the more intricate areas of the interface, such as crafting and assigning abilities, will still need to be navigated by mouse. Depending on your character build, this is perhaps the ideal way to play Champions, with the mobile combat playing more like a sandbox superhero title such as Spider-man 2 or Hulk: Ultimate Destruction – unlike many similar MMORPGs players can move and block freely during conflicts. 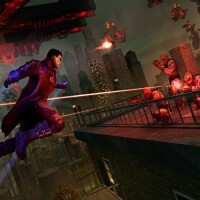 The three preset control methods (MMO, shooter and brawler) each lend combat a slightly different flavour, and you’ll perhaps want to test a different hero archetype on each before deciding whether to play the game as a Streets of Rage inspired beat ‘em up, a third-person shooter or settle for the more accustomed World of Warcraft method. If you’ve got a powerful enough PC this spandex world is also a beautiful one, albeit more camp and colourful than Adam West’s Batman. The game’s cel-shaded visuals genuinely feel like a comic book in motion. Even the menus follow this aesthetic, with the character select screen resembling a stack of issues from metaficitonal publisher Cryptic Comics, and speech bubbles spouting from innocent bystanders and vindictive hoodlums alike. The fittingly ostentatious score is likewise superb, conjuring any number of superhero movies and Saturday morning cartoons, and though voice acting is sparse its hammy delivery more than suits the deliberately cornball cutscenes. As is common with new MMORPGs, Champions is still lacking in a few areas, though if anything, the game’s failings are a result of its own successes. One current issue is the lack of involvement from other players. The objectives and instances are so regularly manageable for solo players that few heroes seem to want to team up or sidekick (by which players raise or lower their level to match a partner’s), that at times Champions feels like a visually superior Diablo clone that just happens to have other player-controlled supers pursuing the same objectives as your own. PvP is also currently undernourished, with the sole enclosed free-for-all Cage Match feeling like a last minute addition rather than an ample constituent of the overall package that this game urgently needs. The streamlined crafting system is generally effortless, but also never particularly involving. The game also provides the same experience regardless of the hero you create, which drains the joy from levelling an entirely new hero when you fancy a change from your initial creation. While reaching the desirable level 25 – at which point you design and create your hero’s arch-nemesis – is generally a blast, there’s an impending sense that you’ve already seen everything Champions Online has to offer. The low level goons don’t offer much in the way of variety, either; Project Greenskin has mindless radioactive mutants, Canada Crisis the virtually identical Ice zombies, while Millennium City’s numerous gangs (some of which Warriors fans will dig) are visually distinctive but rarely require separate strategies to defeat. Of course, many of these criticisms are likely to be reconciled over the upcoming months. If Cryptic treat Champions’ subscribers as they did City of Heroes’, then expect frequent and substantial updates for the foreseeable future – that they’ve already announced the first live content patch, the werewolf-themed Blood Moon, several days before the game has even made it to European shores, is very promising indeed. 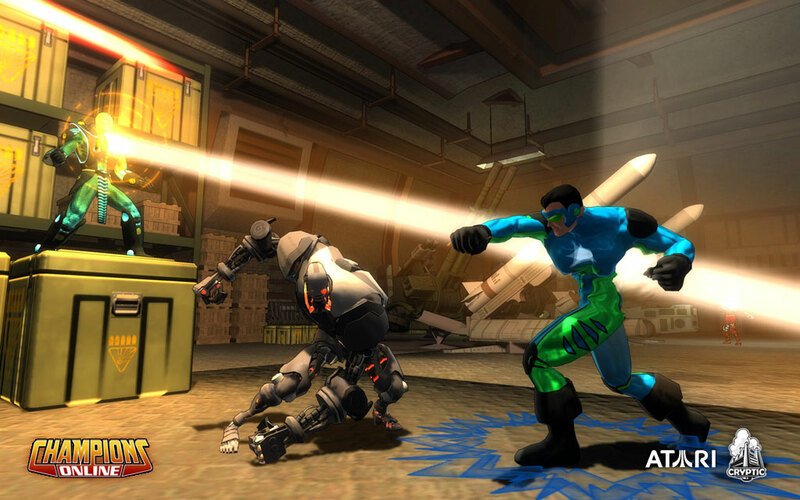 Anyone who enjoyed City of Heroes will be familiar with the developer’s commitment to their subscribers. 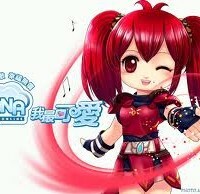 The MMO is never an easy genre to review, as new content and improvements are continuously being implemented. But as far as releases go Champions Online is already pretty stable. Several glitches that should have been rectified in the earliest Betas are still here, though; picking up objects often provokes freaky, rigid animations, as does hurling said objects. All in all, it’s been one of the most satisfying MMO launches I’ve had the pleasure of playing from day one. 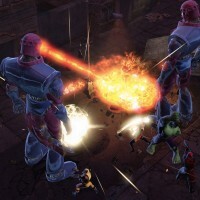 Some comic fans will likely wait to see how DC Universe Online turns out before deciding on which superhero MMO to invest in, but they’ll be wasting a good six months that could be spent playing Champions Online. What the game lacks in an established mythos it makes up for with great humour and an unabashed love for the absolute cheesiest of comic book conventions. As far as MMO launches go, it’s already offering a stable, polished and involving experience, not even a week into release. But… there’s still the feeling that this game doesn’t currently have enough in the way of variety. The core gameplay is great, but the inadequate PvP offerings and potentially solitary nature of the game suggest that players may tire of Champions long before they reach their tailored nemesis at level 25. Nonetheless, anyone with even a mild interest in comic books, superheroes or an action-orientated MMO with an animated aesthetic should definitely try Champions, regardless of whether they plan to pay the 14.99 USD/12.99 EUR/£8.99 GBP monthly subscription for more than a few months.